USDJPY is under the influence of economic reports in Japan and the US; BOJ Core CPI y/y, SPPI y/y and Tokyo Core CPI y/y in Japan and Flash Services PMI, Prelim Wholesale Inventories m/m, and Goods Trade Balance in the US. 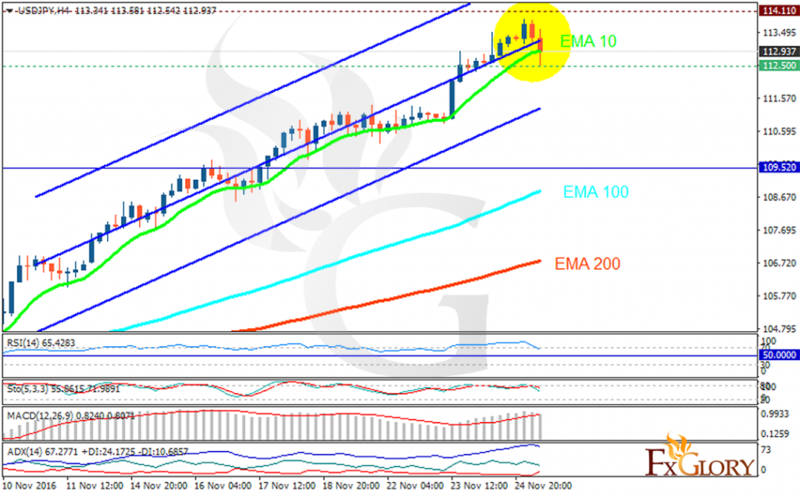 The support rests at 112.500 with resistance at 114.110 which both lines are above the weekly pivot point at 109.520. The EMA of 10 is moving with bullish bias along the ascendant channel and it is located above the EMA of 200 and the EMA of 100. The RSI is moving in overbought area, the Stochastic is showing downward momentum and the MACD indicator is in positive territory. The ADX is showing a weak buy signal. It seems the pullbacks have started so short positions are recommended while the correction pattern is created.